Your home is the most important asset you have, so when you’re ready to build, remodel, add a deck or porch, finish a basement - whatever it might be - give us a call and let's get started! 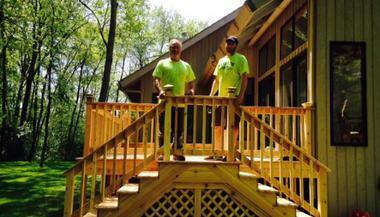 We’ve been in the building trades for over 30 years, specializing in residential construction. We are fully insured and bonded, and our goal is to make you happy. Most importantly, we work hard to finish each project on time and keep you informed and understanding each step of the project. We are a small company with big talent. Pete comes from a long line of old world carpenters, he learned from his father who learned from his father...and so on. Now son Ryan has joined in the family business - who knows, someday grandson Ryder might come on board. Lots of years of experience and know-how to lean on. Our main reason for being in this business is because we love what we do - and we do it well. 3. Your satisfaction is our goal.